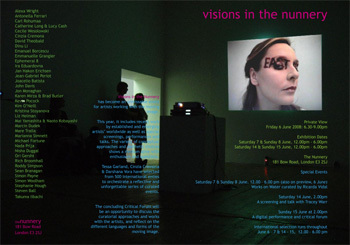 Visions in the Nunnery has become an unmissable event for artists working with the moving image. This year, it includes recent work by established and emerging artists worldwide as well as special screenings, performances and talks. The variety of conceptual approaches and aesthetic choices shows a medium alive with enthusiasm and questions. Tessa Garland, Cinzia Cremona and Darshana Vora have selected from 300 submissions to orchestrate a reflective and unforgettable series of curated events. The concluding Critical Forum will be an opportunity to discuss the curatorial approaches and works with the artists, and reflect on the different lives of the moving image. Alan Smith, Andrew Cross, Cinzia Cremona, Ori Gersht, Mare Tralla, Simon Payne, Karen Mirza and Brad Butler, Dinu Li, Steven Ball, Carl Rohumma, Nada Prlja and Jean-Gabriel Periot. A screening including recent work by Andrew Cross, curated by Ricarda Vidal, 6-7 June. A screening and talk with Tracey Warr on Saturday 14th June from 12.00pm.